A century and a half of the world’s best “Friend” - D.C. Thomson & Co. Ltd. The world’s longest-running weekly women’s magazine celebrated 150 years of continuous publication in January. First published on January 13 1869 from an office in Bank Street, Dundee, The People’s Friend set out to “instruct and entertain” its readers. A century and half and thousands of issues later it continues to do just that. With a current weekly readership of 400,000, the magazine is known, loved and trusted around the world. As well as its UK readers, around 20,000 copies are exported each week to recipients as far afield as Australia, New Zealand, South Africa and Canada. Carrying around 600 short stories each year across the weekly magazine, the three weekly special and the annual, The People’s Friend is the biggest publisher of magazine fiction in the UK and adheres to its founding intention that the publication would have “Nothing admitted into its columns having the slightest tendency to corrupt the morals either of old or young”. To mark the anniversary a symposium on The People’s Friend will take place in April at Glasgow’s Mitchell Library in conjunction with the University of Strathclyde with a day of talks about the magazine’s place in publishing history. In May, the Scottish Storytelling Centre in Edinburgh will mount an exhibition of original cover art and run a series of events. 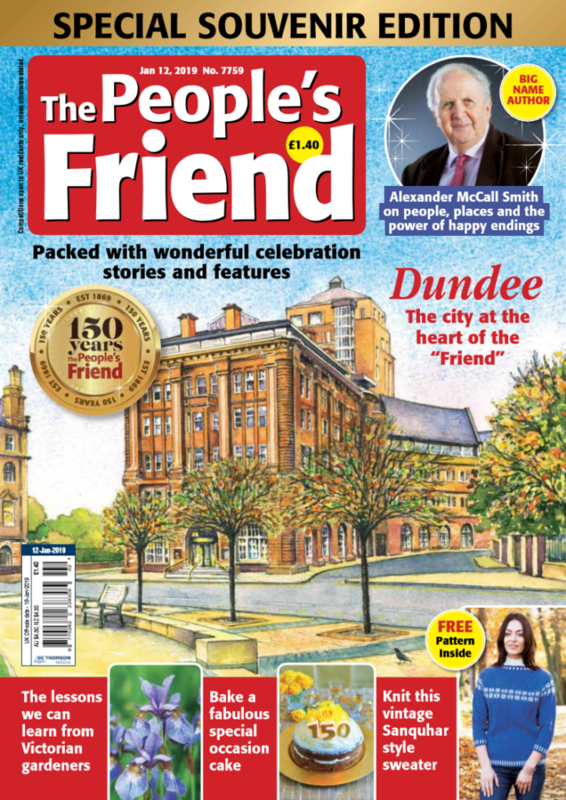 Later that month, The People’s Friend will host a readers’ weekend at Alvaston Hall, Crewe to meet the team behind the magazine, hear about the history of the publication and take part in “Friend” activities. Later in the year, a further series of talks will take place at the National Library of Scotland in Edinburgh. There are also plans for short story writing workshops during the anniversary year. Angela Gilchrist, Editor-in-Chief of The People’s Friend since 2007, said: “We’re proud to have maintained the founding values of the magazine. They are embedded into the ethos of the magazine – this is what The Friend is about and what it stands for. “The famous founding statement which was in the first issue talks about ‘Nothing in the columns intended to corrupt the morals of young or old’ and that is very much the principle of the magazine. There will be nothing to upset or offend. The Friend is all about entertainment so people feel better for reading it, not saddened, upset or frightened in any way. “Reaching this milestone is amazing and is proof of the relationship we have with our readers. No other magazine can come close to this. And that more than anything is what has made it flourish for 150 years. “Readers tell me how much they look forward to the magazine coming though their door every week. They say it’s like welcoming a friend in to their home. “It’s not unusual for people to read The Friend every single day for 40, 50 or even 60 years. Or for one, two or even three generations of the same family to pass on the habit of reading The Friend.